Successfully Added Portable Automatic Battery Charger (5000mAh) to your Shopping Cart. Portable Automatic Battery Charger with one button operation, power level LED, and multi-attachments to deliver 5000mAh of continuous power to all your electronic devices! If you're looking for dependable emergency power for all your small electronic devices, look no further. This universal battery charger pumps out 5000mAh of continuous current for hours and hours of MP3 listening, MP4 watching, cellphone talking, PSP / Nintendo DS playing, and Apple iPhone-ing. Versatile and powerful, this is one battery gadget that would make even Thomas Edison proud! 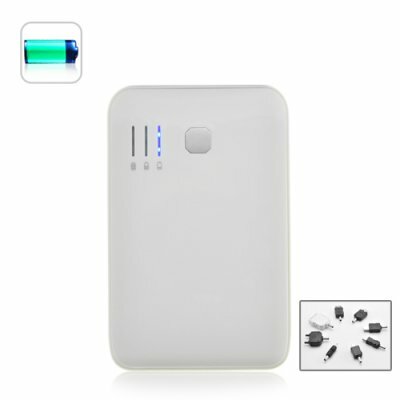 Sleek and elegant this all white Portable Automatic Battery Charger is solidly constructed and comes with a refractive finish to resist fingerprints and other smudges and stains. It's got one button operation for powering up and powering down, features three LED lights to indicate capacity, and most importantly, can charge 2 products at the same time! With this one Portable Automatic Battery Charger, you get an unbeatably-priced standby power source for almost all of your portable electronics. Available in our warehouse now. Order today and we'll express ship it out tomorrow. Brought to you by the leader in China Electronics - Chinavasion. Great charger for emergencies or when outdoors. Compact form factor will fit easily in your bag, briefcase, purse, even in your pocket!